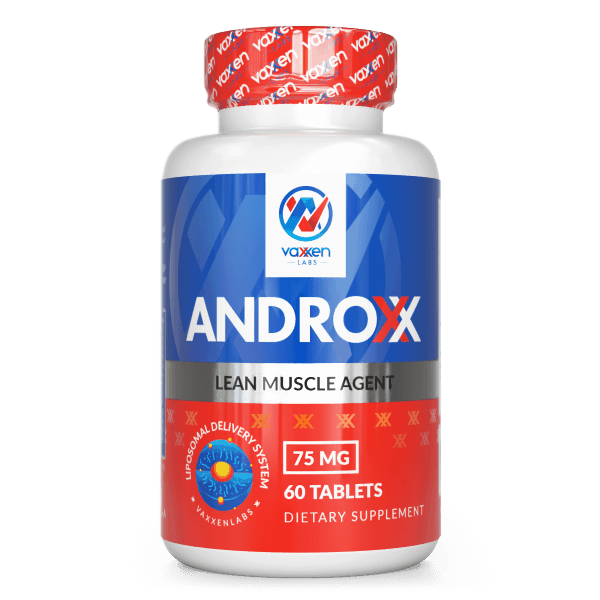 Androxx - 1-DHEA Lean Muscle Agent Supplement - Vaxxen Labs, Inc.
Stop accepting your physical limitations. 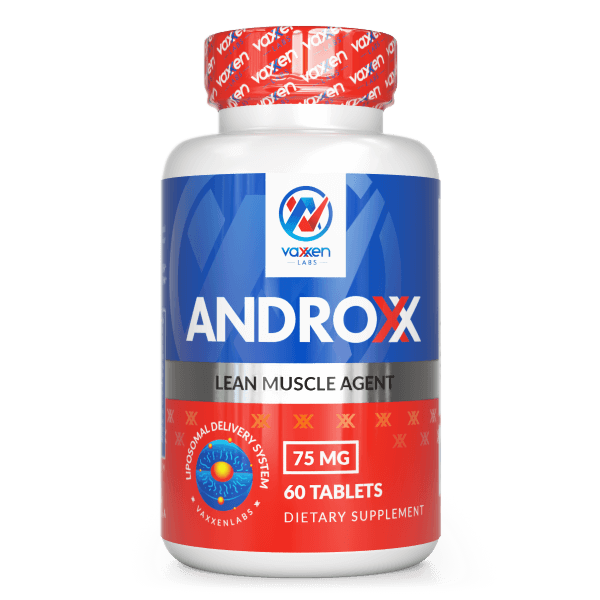 Take Androxx to experience the ultimate gains in lean muscle and push your body further than you ever imagined to get the results you deserve. Androxx packs a one-two punch – first converting Androstenediol to Androstenedione in the body, and then finally – converting to 1-Testosterone. And, with the exclusive Liposomal Delivery System, you can be confident your absorption rate is going to be almost 100%. 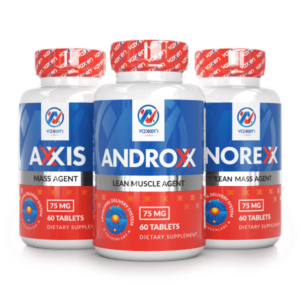 Buy ANDROXX NOW and transform your body fast. 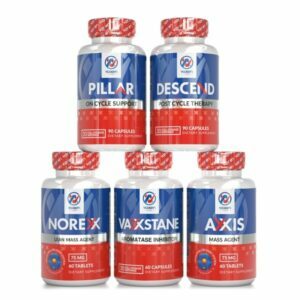 Androxx (1-DHEA) produces “anabolic like*” gains, for individuals looking for more lean muscle mass or to help preserve muscle during a cutting cycle. 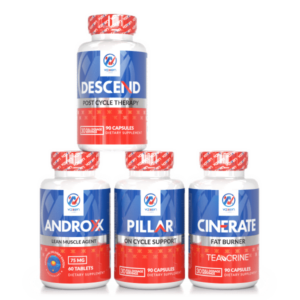 If you are looking to take your body to the next level, Androxx, is the right choice. Reduce your risk for low-DHEA-related issues including mood disorders, inflammation, sexual dysfunction, and muscle loss with Androxx, an anabolic precursor that builds muscle. 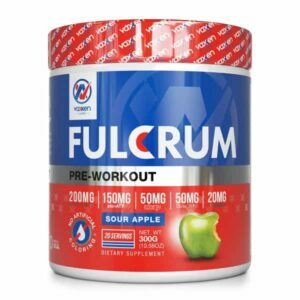 You’ll be able to focus on the lean muscle growth and really see the difference – thanks to the lack of water retention and bloating found in other products that can hide your results. Androxx contains 1-androstene-3b-ol,17-one – otherwise known as 1-androsterone and 1-DHEA. Once consumed, the body converts it to 1-Testosterone through a two-step process to give you the benefits of testosterone but without the negative effects of estrogen. 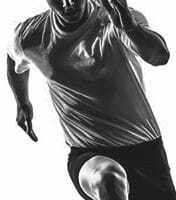 1-DHEA helps create moderate gains of lean muscle mass and strength. It’s fairly easy to maintain post cycle, too, since water retention for both extra-cellular and intra-cellular are minimal. The human body will naturally attempt to reject anything foreign – whether that’s a vitamin, a supplement, or a drug. Androxx features the exclusive liposomal delivery system to increase the bioavailability of the supplement. Liposomes encapsulate the Androxx compounds to protect it and ensure it reaches its targeted destination in your body. This means your body will be able to absorb more of the nutrition and benefits of Androxx, so you get better results, fast. What’s an ester? It’s a compound that will allow compounds to attach and form within the muscle of a body rather than the blood. It’s created by using alkyl to replace the hydrogen in an acid. They will boost fat solubility and lower water solubility. If a compound ends in “ate” it is an ester. Androxx contains two time-releasing esters: 1 androstene-3b-ol,17-one Undecanoate and 1 androstene-3b-ol,17-one Caprylate. An oral 1-DHEA, 1 androstene-3b-ol,17-one Undecanoate offers testosterone benefits without negative side effects. It causes growth of the male organs and muscles, muscle thickening, and anabolic benefits. 1 androstene-3b-ol, 17-one Caprylate is a fatty acid chain that the body can easily digest. It’s a salt from caprylic acid which are used to treat bacterial and fungal diseases. 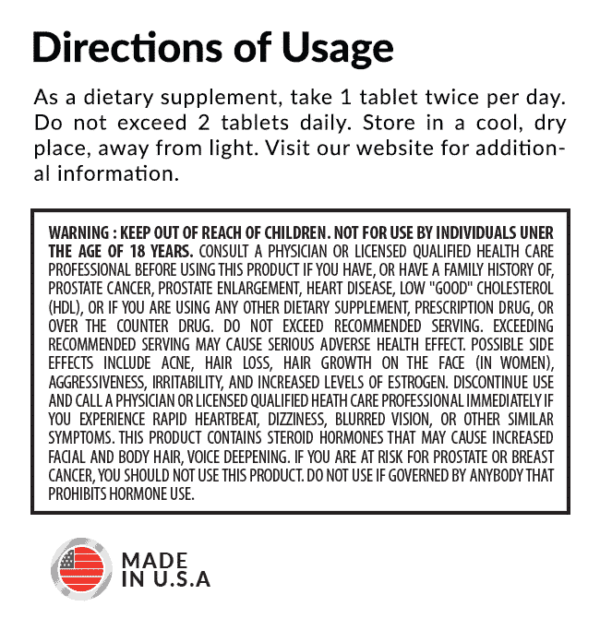 As a dietary supplement, take 1 tablet twice per day. Do not exceed 2 tablets daily. Store in a cool, dry place, away from light. Visit our website for additional information. 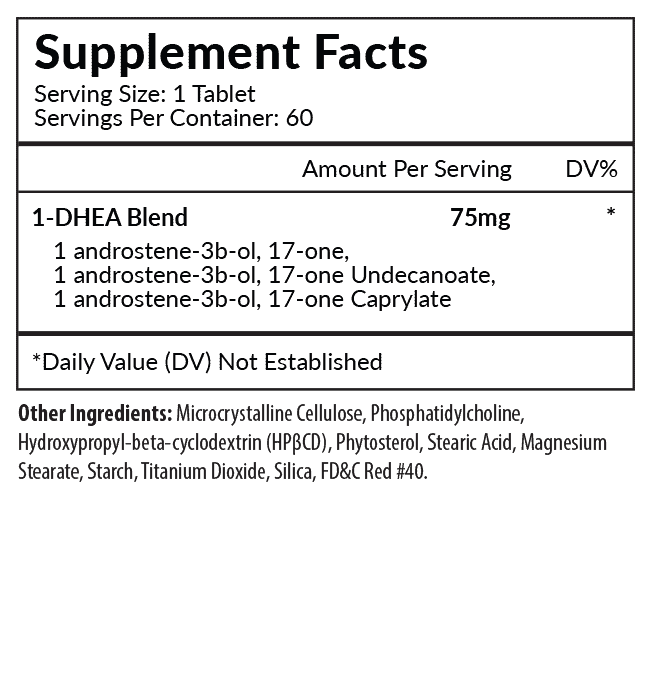 Is this the same as normal DHEA? Absolutely NOT. 1-DHEA, otherwise known under the nomenclature: 1-Andro, 1-Androsterone, 1-Dehydroepiandrosterone, 1-androstene-3b-ol-17-one or 3b-hydroxy-5a-androst-1-en-17-one, is an anabolic precursor (pro-hormone) that produces steroid-like results by converting to Testosterone in the body. It is highly androgenic and anabolic. What products should I take with Androxx? 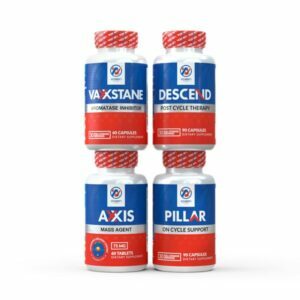 For the best results, we recommend taking an on cycle support product (PILLAR) and a proper post cycle therapy regime (DESCEND) when taking Androxx. Does Androxx convert to Estrogen? Unlike 4-DHEA (Axxis), Androxx will NOT convert to estrogen in the body. Can I stack this with the other Anabolic Precursors you sell? Absolutely. Everything should be based on goals and experience. 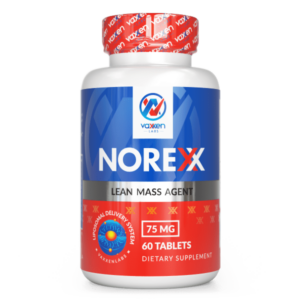 Stacking Norexx alongside Axxis (4-DHEA) and/or Androxx (1-DHEA) will most assuredly help you reach your desired goals. I am a female - can I take this product? Being a testosterone precursor we’d advise against females using Androxx. However, Norexx (19-nor precursor) is a more acceptable and desirable option with women in mind! How long should I take off hormones after using this product? We recommend using Androxx for 4-6 weeks per cycle. Our general rule of thumb is: time on = time off. If you use the product for 4 weeks, we suggest you take 4 weeks off following your post cycle ending. Is the product better absorbed if chewed or dissolved sublingually? No, you will not get better results if you chew or dissolve the product sublingually. Androxx is produced with the patented liposomal technology that coats the hormone in a fatty membrane allowing it to pass through the liver and intestines unimpeded to promote up to 99% absorption and conversion rate in the body. 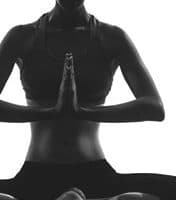 We recommend swallowing it as a normal pill and allowing the liposomal technology to do its job and ensure the compound reaches the target areas of your body. You can expect lean, dry gains in mass when taking Androxx. Being as it does not aromatize, you will avoid the annoyances that accompanies elevated estrogen levels (bloating, gynecomastia etc). No, by scientific design it is NOT methylated and will not adversely affect your liver unlike the many steroid based compounds in the past.